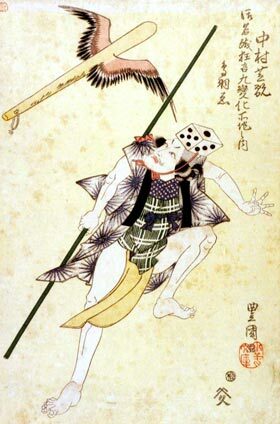 The actor Nakamura Shikan I, who was about to travel back to his native Kamigata, performed his onagori kyôgen in the 9th lunar month of 1819 at the Nakamuraza, which included a spectacular 9-role hengemono which was entitled "Onagori Oshie no Mazebari". One of these roles survived and became the independent dance "Tobae". "Tobae" is a witty cartoon set in the Edo period, that mimics the style of "Caricatures of Birds and Beasts" drawn by Toba Sôjô, the father of Japanese cartoons. In this "Tobae", a naked man is in the kitchen running after a mouse holding a wooden measuring utensil. Next to him is a wooden pestle with wings flying through the air. This comical scene is brought to life in this dance.